From the cell wall inward, most bacteria are much alike. The bacterial cell wall and materials adhering to its surface are the main ways in which we differentiate one species or strain from another. Article Summary: Some bacteria have an additional layer outside of the cell wall called the glycocalyx. This coating of macromolecules protects the cell and helps it adhere to surfaces. A glycocalyx is considered a slime layer when the glycoprotein molecules are loosely associated with the cell wall. Bacteria that are covered with this loose shield are protected from dehydration and loss of nutrients. The glycocalyx is considered a capsule when the polysaccharides are more firmly attached to the cell wall. Capsules have a gummy, sticky consistency and provide protection as well as adhesion to solid surfaces and to nutrients in the environment. Bacteria that possess capsules are considered to be encapsulated, and generally have greater pathogenicity (ability to cause disease) because capsules protect bacteria, even from phagocytic white blood cells of the immune system. The adhesive power of capsules is also a major factor in the initiation of some bacterial diseases. 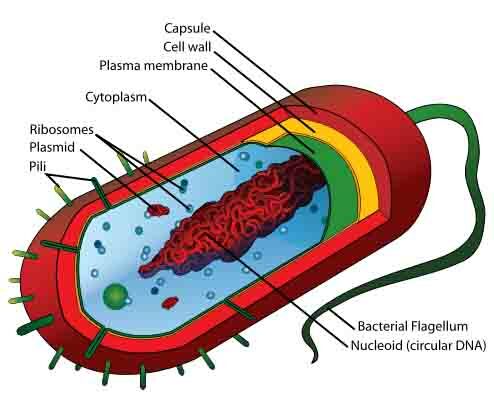 Prokaryotic eubacteria (bacteria) have a cell wall made of a unique substance called peptidoglycan. The rigid structure of peptidoglycan gives the bacterial cell shape, surrounds the plasma membrane and provides prokaryotes with protection from their environment.